WASHINGTON — Former Maryland Gov. Martin O’Malley is at risk of being excluded from the next Democratic presidential debate based on criteria released Friday by NBC News. In order to qualify for the January 17 debate in Charleston, South Carolina, a candidate must reach an average of 5 percent either in recent national polls or in polls in the early voting states of Iowa, New Hampshire or South Carolina, NBC said. 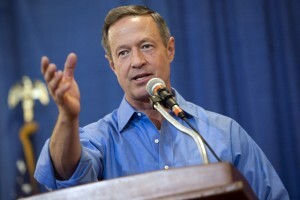 O’Malley has been polling at about 5 percent in Iowa, but is falling short of that in New Hampshire, South Carolina, and in national surveys. He has trailed Democratic presidential candidates Hillary Clinton and Bernie Sanders by wide margins in the campaign for the party’s nomination. NBC said the candidates would need to reach the 5 percent threshold in five recent polls recognized by NBC and published before January 14. That means O’Malley would need to maintain his standing in Iowa in any upcoming polls in order to appear on the debate stage. O’Malley’s campaign did not immediately comment on the NBC criteria. Spokesmen for the Clinton and Sanders campaigns said they hoped all three candidates would be included on the debate stage. The South Carolina event will be the final DNC-sanctioned debate before the Iowa caucus on Feb. 1 and New Hampshire primary on Feb. 9. The DNC has scheduled another debate on Feb. 11 in Wisconsin.